We are happy to announce a great opportunity for starting with data mining or optimizing your data mining skills with the open source software RapidMiner: In June 2012, Rapid-I will provide a one week training course on data mining and business analytics with RapidMiner and RapidAnalytics in Atlanta, USA. Between June 12th and 15th, 2012, the course will be given by a certified senior data analyst and experienced lecturer of Rapid-I. 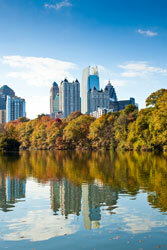 It will take place at the Georgia International Convention Center (GICC) directly located near the Hartsfield-Jackson Atlanta International Airport and only a few minutes from Downtown Atlanta, USA. This training course is a four day introduction for data mining and shows how to perform predictive and business analytics with the well known software RapidMiner and the data analysis server RapidAnalytics. After this training course the participants will have a complete understanding of how Rapid-I software works and is used. Due to a high number of practical exercises, the participants will be able to transfer the gained knowledge to own data mining problems and solve them quickly and easily. Please write to [email protected] for getting more information or registering to this training course. Seats are limited! For more information or registering to the course, please write to [email protected]. The last day also offers an opportunity to participate in the Rapid-I Analyst Level Exam in order to achieve the corresponding analyst certification. Prove that you are a real expert in data mining, predictive analytics, and of course in using RapidMiner.